Now that I have a puppy (a very active puppy! ), I am spending more and more time walking in the great outdoors. And of course I have come to have my favourite spots for walking Josie here in the Comox Valley. So I thought I would do a blog series on my favourite dog walking trails. So today’s post is all about my #1 favourite dog walking park in Courtenay: Seal Bay Park! Managed by the Comox Valley Regional District, Seal Bay Park has it all: endless walking and multi-use trails, an ocean playground, lots of wildlife and views of mainland mountains. It is over 652 hectares in size and is never crowded. 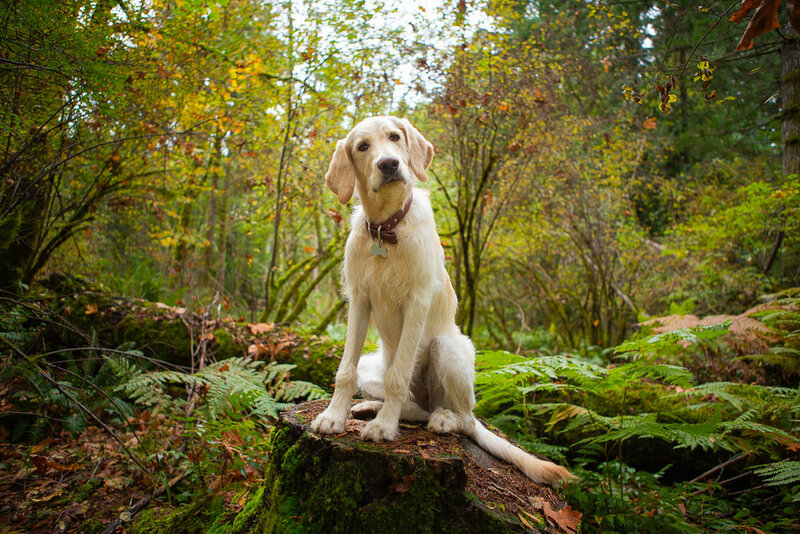 There are leashed and leashing optional trails for dogs, although in the spring there is mandatory leashing due to nesting and fawning season. Josie learned to swim here last week! One of the fun things about Seal Bay’s beach is that you almost always see seals, either on the rocks or swimming in the distance. Once I even saw orcas! Unfortunately the beach is rocky, but at low tide there is a bit of sand to play on. Every season in this park has it’s own beauty. I think I love fall the most. The colours are spectacular. Even though I detest winter, sometimes the crisp winter air is refreshing. One of my favourite walks with Josie is around Melda’s Marsh. Often you can see beavers swimming around in the evenings. Although there are several ways to enter the park, the main lot is on Bates Road. From there you can take one of three trails that meander down to the ocean (coming back up is a chore), or cross the road for more trail options. My hubby and I have started biking the 10k horse bike loop. That is a great way to tire Josie out. Stay tuned for more posts about my favourite dog walking trails in the Comox Valley. Let me know if you have any trails you’d like me to try out! I’m always looking for more places to go. I’ll leave you with a few more shots of the park.